Are You One of the Happy Ones? If you are happy in your job, or with what you do for a living, then this month’s entry isn’t for you. In fact, you can stop reading now. Unfortunately, that won’t be many of you. A 2011 Gallup survey showed that 71% of workers are “not engaged” or are “actively disengaged” from their work. This surprising statistic was confirmed by a 2012 survey by HR company Jobvite, who found that 75% of working-age Americans are “job seekers” — they’re either “actively seeking” a new job or “open to” a new job. That’s a whole lot of unhappy people. Whether you are an employee or an employer, the implications of this are tremendous. If you are an employee, you are dedicating roughly 40%-50% of your day to a job that leaves you feeling unsatisfied. If you are an employer, you are working with a team that I would hardly call enthusiastic or committed. According to Gallup, people who are “emotionally disconnected from their workplaces are less likely to be productive” and are more likely to leave. That’s a whole lot of wasted talent. Most of these unsatisfied people feel this way because they do not feel challenged, appreciated or they don’t feel as if they are a part of something bigger and more meaningful. Essentially, they feel like they are little more than a cog in a wheel. So what can you do in 2013 to change your situation and begin experiencing a more engaged work life or team? Here are 3 quick steps to begin the transformation. 1. Take the temperature of your employees to find out how satisfied they are and what are their areas of discontentment, if any. If you don’t have an understanding of the current condition, then you can’t make appropriate changes. And be sure to look for areas of discontentment. Those are the areas that hold the most potential for positive change if addressed. 2. Assess the level of appreciation you show for your team. Do you do it regularly? Do you do it publicly? Do you acknowledge and recognize both big and small acts that exemplify the behavior, culture and performance you wish to have at your company? 3. Challenge yourself and your team. Status quo equals stale and boring. Get creative! Set a big goal and go for it! Take measured risks! Create adventure! Engaging yourself and your team in this manner keeps things exciting, fresh and moving forward. 1. Take ownership of your current situation and your future. All too often the finger is pointed at management as the problem. If you are unsatisfied or don’t like the way something is going and have not said anything, then there is only yourself to blame. Do not take on the role of the victim and then blame everybody else for your unhappiness. 2. Ask yourself if you are unhappy with the work you are doing or with the company/management. If it is the latter, it may be time to consider moving to another company. There is most likely something about the company that is not aligned with your core values and beliefs. If it is the former, it might be time to reconsider your line of work and the choices that got you there. There is something about what you do for a living that is not fulfilling. 3. Take the smallest of actions to break the inertia and get your momentum moving in a direction you desire. Don’t wait thinking or hoping things will get better next month or next year. If you have been unsatisfied for a while, then you need to take action. Do not let inertia keep you in your unhappiness. That is a guaranteed path to future unhappiness. Take action. Choose a job you love, and you will never work another day in your life. We spend way too much of our time at work to not enjoy what we do – whether that is because of the work you are doing, the people you are doing it with or the culture and practices that exist at the company. The great news is that it is within your power, whether you are an employee or employer – to change all of that. Do not resign yourself to a life of suffering at work, for life is not intended to be miserable. 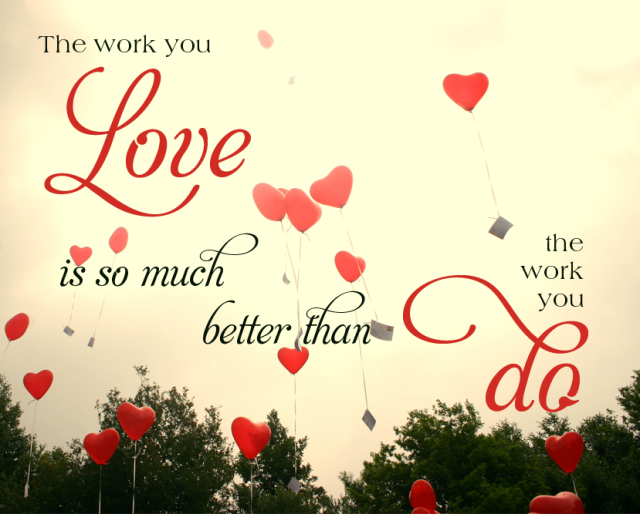 Here is some great inspiration for doing what you love!